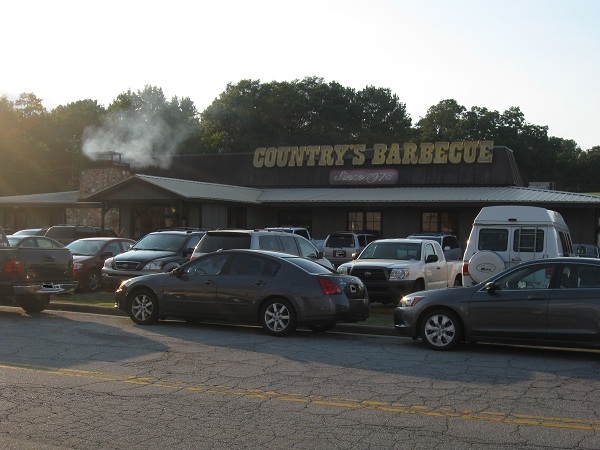 Country’s Barbecue, Columbus GA – Marie, Let's Eat! Our day trip to middle Georgia and Alabama brought us back to Columbus after some time spent shopping at Hastings. We spent better than an hour enjoying the city’s Riverwalk along the Chattahoochee before going to visit our friend Cheryl, who had recommended we stop at Mrs. Story’s earlier in the day. We had a good time telling stories and hearing about her new stepdaughters before we decamped to get some supper at one of the town’s roadfood heavyweights, the incredibly popular Country’s Barbecue. Now, it’s possible that some other regions have a small chain with as much local loyalty as Country’s has in Columbus, but I’m drawing a blank. The first Country’s was built in 1975, promptly burned down, was rebuilt, burned down again and finally emerged in the late ’70s as an incredibly popular powerhouse that the local folks really love. It has expanded to eight locations in the region: three in Columbus (one of which, downtown in an old bus depot, uses the frame of an old Trailways bus as a dining room), two in Montgomery and one each in the Alabama cities of Opelika, Prattville and Troy. The other barbecue chains in the area, 13th Street (which I have heard is quite good) and Mike & Ed’s (which I know for a fact is), are operating in Country’s shadow. Around 2002, Sonny’s Real Pit Bar-B-Q moved into Columbus. This is a chain with 138 stores in nine southeastern states. Now, normally in this blog, I don’t like to name restaurants where I’ve had a disagreeable experience; everybody’s got to make a living and restaurant owners have it tough enough without upitty bloggers badmouthing them. Sonny’s, I couldn’t care less about their feelings. Chains that big can go sink, especially when they serve food as mediocre as this place does. Anyway, Sonny’s moved into a space off US 80 with hoopla and raised eyebrows. My friend Matt, whose hometown pride can be firey, got really aggravated that they would dare invade Country’s turf, but he was also confident that the locals would see Sonny’s off. The store closed inside of two years. The lesson learned: if you want to sell on Country’s patch, you’d better have some superior product. As the parking situation in the photo above demonstrates, the original Country’s, which is just off Macon Road, exit 6 on I-185, is an incredibly popular Saturday night destination. There is always a wait, and there’s often live music. This past weekend, there was some excellent bluegrass in the background. Unfortunately for us, most of our meal came in between sets! I mentioned in an earlier chapter how Columbus is home to the scrambled dog. There is another local concoction that I don’t know that I have seen anywhere else, and these are the barbecued onions. They’re pictured above and I always get them as one of my sides at Country’s. They’re incredibly sweet, grilled onions served in a thin sauce. Nobody’s going to want to smooch with you after a bowl, but you’ll live. The pork is very moist and very smoky and really doesn’t need much sauce at all, unless you’re like me and are anxious to drown your meat in it. They have a pretty good tomato-based sauce and an excellent mustard-based one, along with a very hot “back-fire” mustard sauce that you have to request be brought to the table. Marie was especially taken with her meal here, and wondered why the heck I haven’t been taking her to Columbus more frequently so that she could have been enjoying this barbecue. I suppose I’ve eaten at each of the three Columbus locations at least twice, maybe nine times overall. The next time we are down this way, I really need to try something new, but I might end up petulantly wishing I’d stuck with this wonderful pork and that mustard sauce instead. Posted on September 16, 2010 July 16, 2016 by Grant G.Posted in barbecue, columbus, georgia, regional chains, roadfoodTagged barbecue, columbus, georgia, regional chains, roadfood.com. Just for the record we have 5 franchised stores and no real desire to do anymore. Country’s on Mercury Drive in Columbus Georgia is the original. We realized that we couldn’t successfully duplicate and franchise Country’s without killing what makes us special. We are foodies first, businessmen second. Thanks for writing, Grif! We’re overdue for a trip to Columbus, and while I still would like to visit some of the other barbecue places in town – Chicken Comer and Macon Road, chiefly – I’d love to come by the Veterans Pkwy location, which we’ve never photographed. Maybe in the fall! Pingback: Barbecue Street, Kennesaw GA (take two) – Marie, Let's Eat! 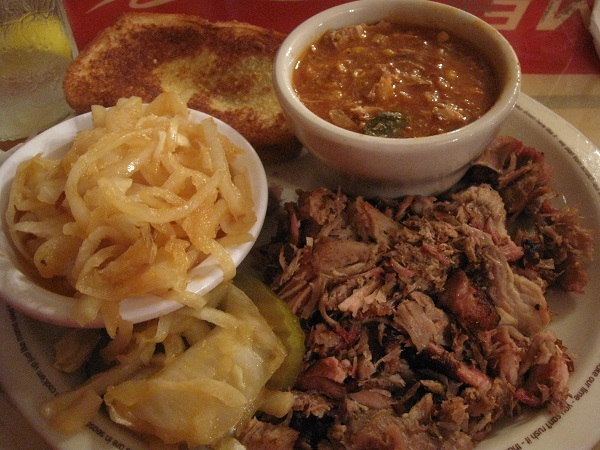 Pingback: Mike & Ed’s Bar-B-Que and 13th Street Bar-B-Q, Phenix City AL – Marie, Let's Eat!